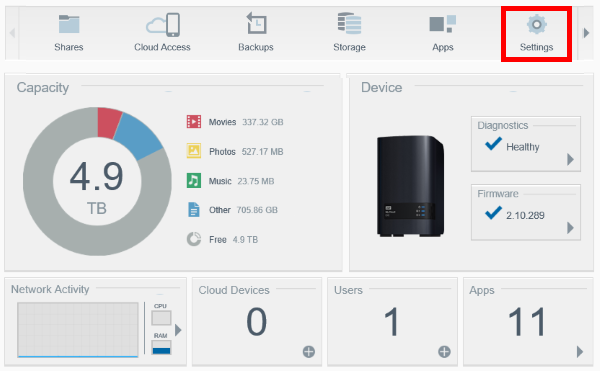 My Cloud storage devices capable of RAID allow the device administrator to delete data on a volume of the network drive, or on the contents of the entire device at once. To delete data on a My Cloud Mirror, EX2 or EX4 storage device, please select follow the instructions below. Please select a My Cloud storage device from the table above to display that device's instructions. From the main page of the My Cloud Mirror Dashboard, click the Settings button of the Navigation bar. 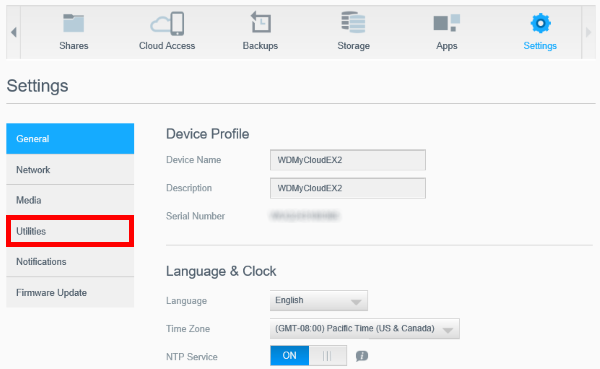 For assistance accessing the Dashboard, please see Answer ID 10420: How to Access the Dashboard on a My Cloud Device. Once inside the Settings area, click on the Utilities option on the left-side panel. In the Utilities area, scroll all the way to the bottom to find Format Disk. Click on the downwards arrow next to All Volume(s) to display all available volumes. 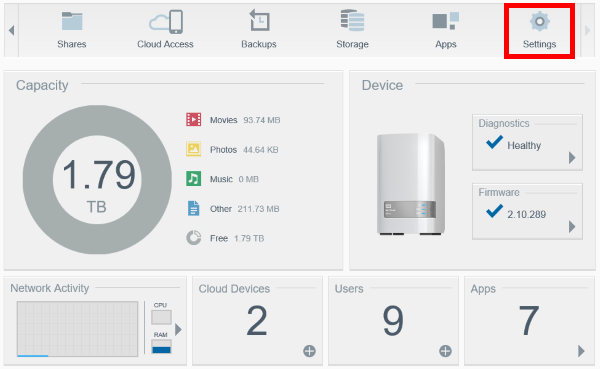 If the My Cloud is set in a RAID configuration that holds various volumes, select the desired Volume, or select All Volume(s) to delete everything on the device. When ready, click on Format Disk. A warning will be displayed. 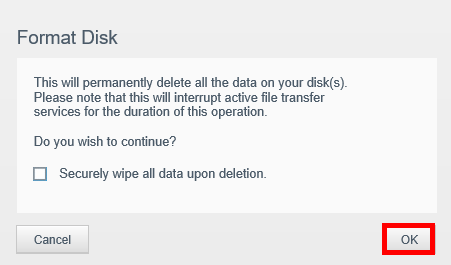 Clicking on Ok will format the disk(s), effectively deleting the data. This process may take several minutes. Checking the Securely wipe all data upon deletion check-box will erase all the hard drives, effectively wiping out all data from the device beyond the point of data recovery. That process will take several hours to complete. When ready, click on Ok to continue. Critical: Performing a Format will delete all information on the My Cloud Mirror. This process is Data Destructive and irreversible. The process will provide a progress bar and will indicate which volume is being formatted at any given time. When done, the Format Disk area will go back to normal, and the process will be completed. From the main page of the My Cloud EX2 Dashboard, click the Settings button of the Navigation bar. For assistance accessing the Dashboard, please see Answer ID 10420: How to Access the Dashboard on a My Cloud Device. Critical: Performing a Format will delete all information on the My Cloud EX2. This process is Data Destructive and irreversible. From the main page of the My Cloud EX4 Dashboard, click the Settings button of the Navigation bar. For assistance accessing the Dashboard, please see Answer ID 10420: How to Access the Dashboard on a My Cloud Device. Critical: Performing a Format will delete all information on the My Cloud EX4. This process is Data Destructive and irreversible.